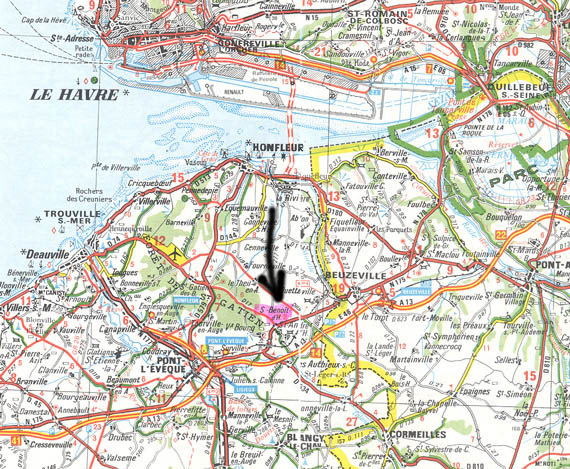 Place of birth of Guillaume Labelle, this old parish was located in Calvados, Basse-Normandie, France. This hamlet was incorporated into the town of St-Benoît d'Hébertot on October 14, 1827 and is now a subdivision of this town. On the 1820 census, 51 peoples were counted as living there (76 in 1794). The presbytary still exist today, but the church was demolished. 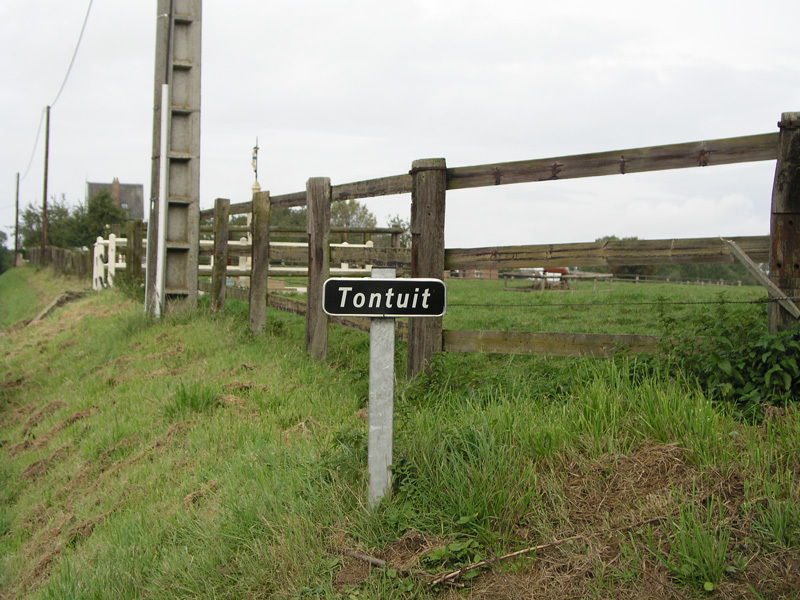 The toponymy of this hamlet changed over time: Tontuict, Le Tontuit, Tonnetuit and today Tontuit. The name contains the ethymological root "Thueist" or "Thveit", ancient "norrois" (old scandinavian's Vikings language) word meaning a cleared patch of land for agricultural purpose. A memorial monument was built in 1934 were the old chuch was located. 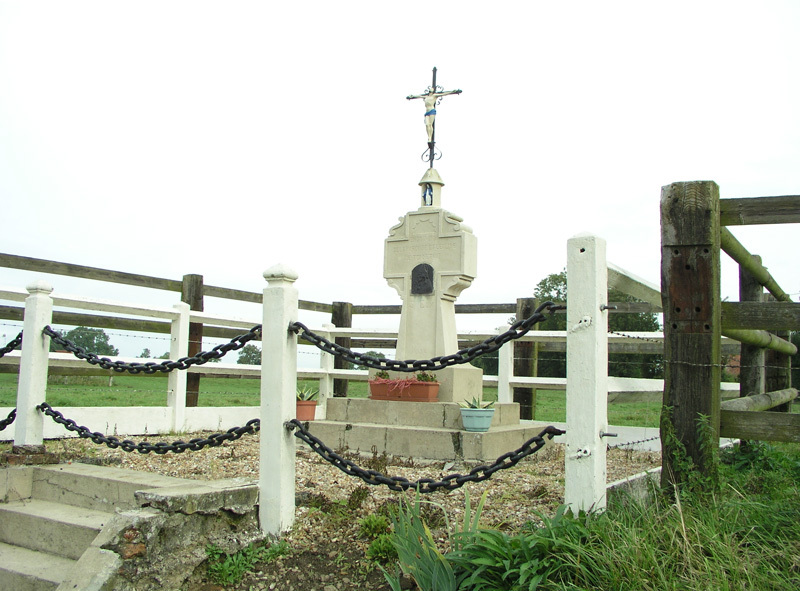 This memorial, in the form a cross, is located on route D119, approximately 1.3 kilometres from the south-east crossing with route D140, right next to the intersection with the road leading to Quetteville. 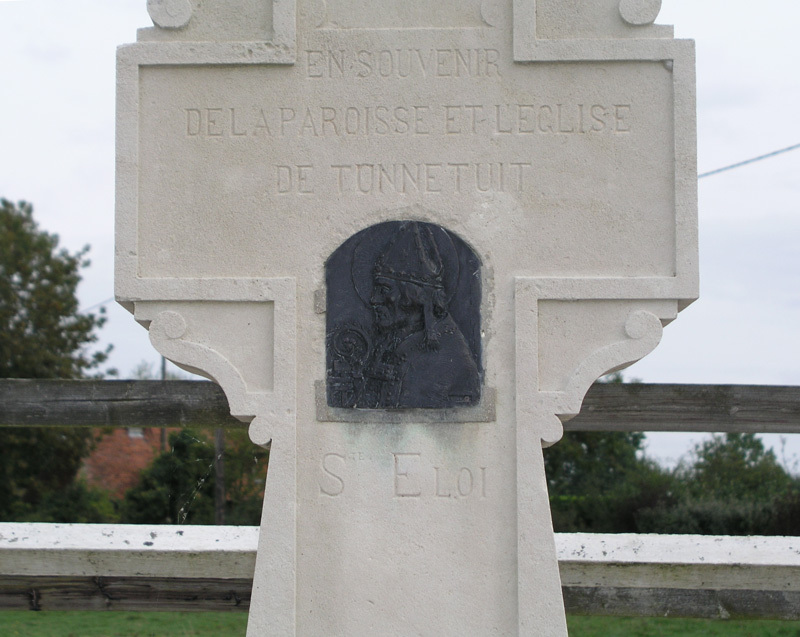 We can read the following on the monument: "En souvenir de la paroisse et l'église de Tonnetuit - St-Eloi" (see next photos). "stèle" on the right of the picture. 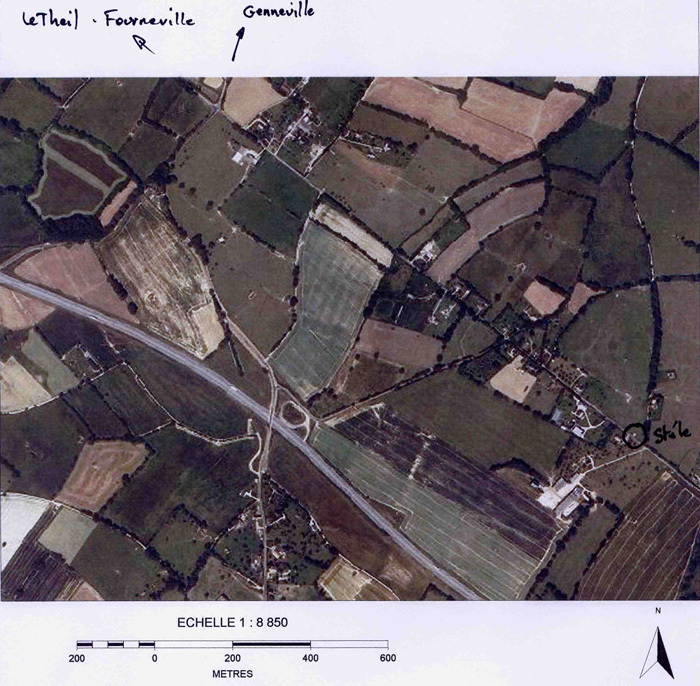 The main road that cross the image is Highway A29 (E44). Thanks to Mr. Claude Chicherie for this photography and for the next three. Photos showing the site and details of the Tontuit memorial. Click on any photos to obtain a larger copy. 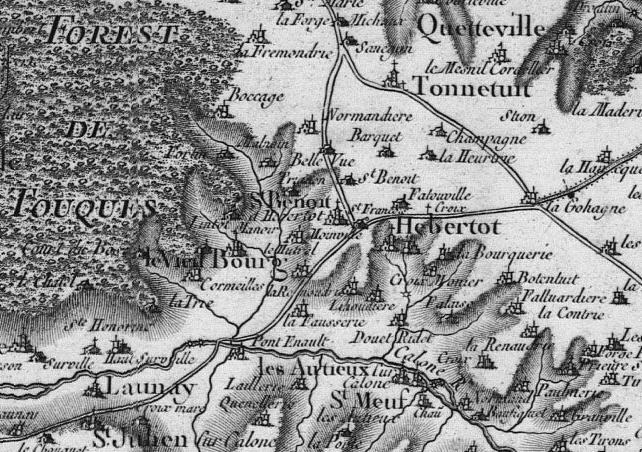 Cassini's map (published between 1750 and 1789) showing the named place «Tonnetuit». Small town of approximately 300 peoples situated in rural country. 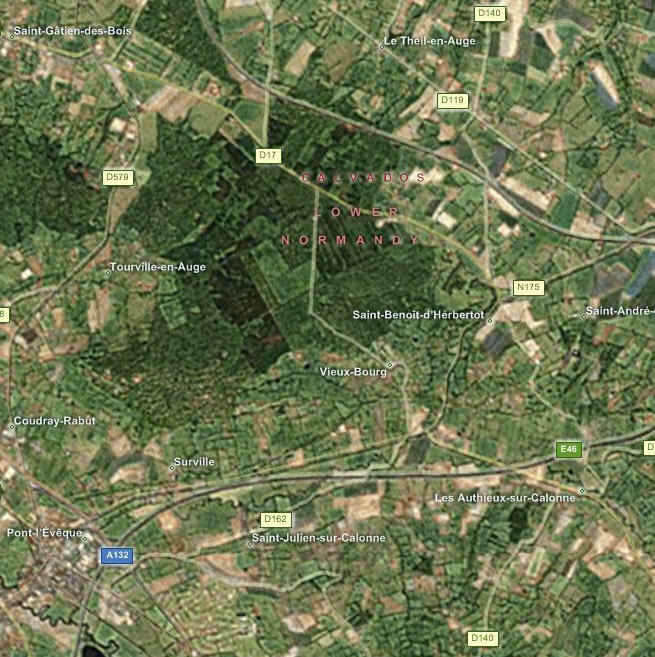 The village center is located at the junction of the departemental road D17 and the national road N175 between Pont-l'Evêque and Beuzeville. Elle couvre une superficie d'environ 7.2 kilomètres carrés. The church was built in the XII° century and was completed in successive phases. In the village we encounter the old presbytary, also built in the XII° century, the new presbytary and a primary school. On the 1999 census, 293 were counted for a density of 40 peoples/m². The population passed from 446 peoples in 1794 to 293 in 1999. Please visit Marie-France Fournier web site for additional details on this town (french only): Bienvenue à St-Benoît d'Hébertot. 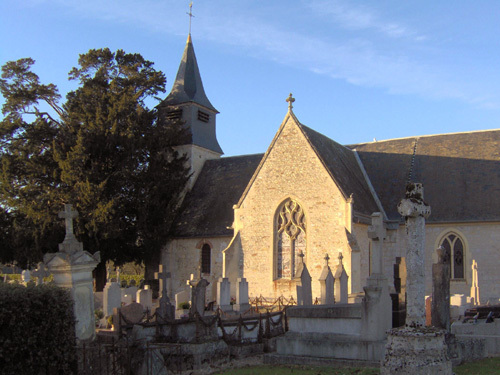 The church of St-Benoît d'Hébertot. Source (church and presbytary): «Marie-France Fournier», Bienvenue à St-Benoît d'Hébertot.